Altimeter. It’s pretty obvious what it shows, but do you know how to set it properly? When to set standard pressure and when to use QNH? Altimeter – how it works? 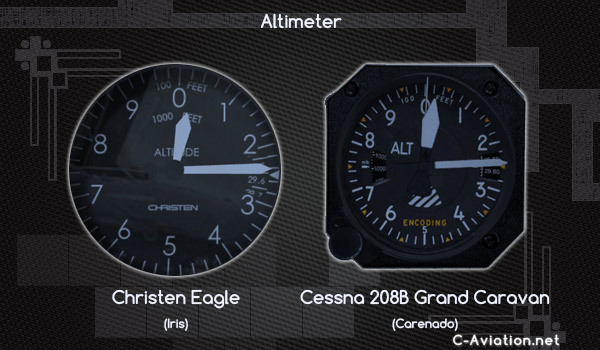 I will not get into technical details of altimeter’s internal design – you can easily check it on the internet. What is important is that it shows the altitude based on atmospheric pressure. Keep that in mind, because you need to properly set the reference pressure to get correct altitude reading. Scale – How to read altitude indication? Typically the scale shows hundreds of feet. Thousands can be read on a drum indicator. If the altimeter lacks the drum indicator – it can have multiple (usually two or three) needles – the longest shows hundreds, a shorter – thousands and the third (usually different in shape from the other two) – tens of thousands. If you fly a Russian plane you will find altimeter scaled in meters instead of feet. The same applies to planes built in Poland (Wilga) and Czechoslovakia (Zlin) some time ago. Also German historical planes (world war the second Luftwaffe planes) use metric altimeters. On rare occasions planes may have extra-precise altimeters which use tens of feet as the scale for the large needle, e.g. wwii torpedo-bombers use such altimeters (their pilots needed to know exactly how high they are to properly drop torpedoes). Atmospheric pressure changes and you need to remember that the altimeter is basically just a pressure indicator – scaled in feet (or meters). So if the pressure drops – altimeter will show higher altitude even if it hasn’t moved. (note this – pressure drops – altimeter shows higher altitude). That is why you need to set it. 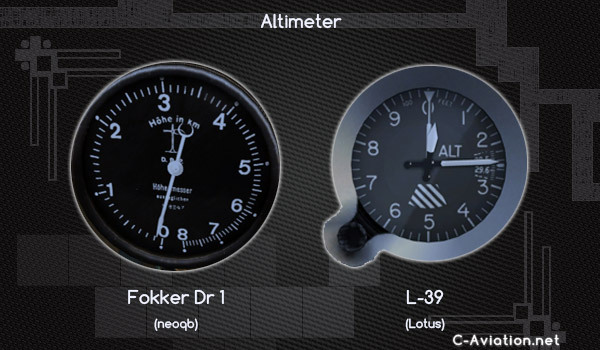 To set your altimeter you need to turn the knob until you see the correct reference pressure in Kollsman window. 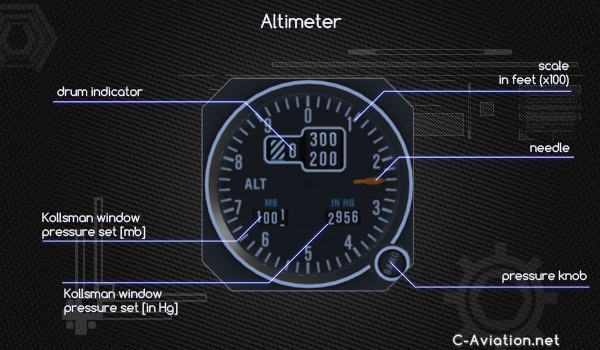 Almost every altimeter has this window and it shows the pressure in millibars or inches of mercury. Sometimes there are two windows for both units. In some rare occasions (Wilga by Aerosoft) you will see millimeters of mercury. Some very basic planes may not have the Kollsman Window (Piper Cub). In such situation – you just set the airport altitude. In most flights you will use QNH and standard pressure. QNH for low level flight, takeoff and landing. Standard pressure (1013 millibars or 29.92 in.Hg) for high altitude cruise flight. When you set current QNH – your altimeter will show the correct altitude above sea level. To get current QNH you need to check METAR message for your airport (or the airport that is closest to you). When you fly cross country at low level you need to adjust your altimeter setting to local QNH. It’s best to check it at the airports you pass. In FSX you can automatically adjust altimeter to QNH using “B” keyboard shortcut (B by default – you can change it in settings). F – field, E – elevation. If you set QFE on the ground your altimeter will show 0. In the air it will show the altitude above airport. For some local flights and aerobatics over the airfield it may be useful to set QFE instead of QNH. It’s highly dangerous to use QFE in mountainous terrain. 1013,25 millibars or 29,92 inches of mercury. Alternatively 1013,25mb / 1013,25hPa / 1atm / 29,92 in. Hg. Standard pressure that should be used in high altitude cruise flight. 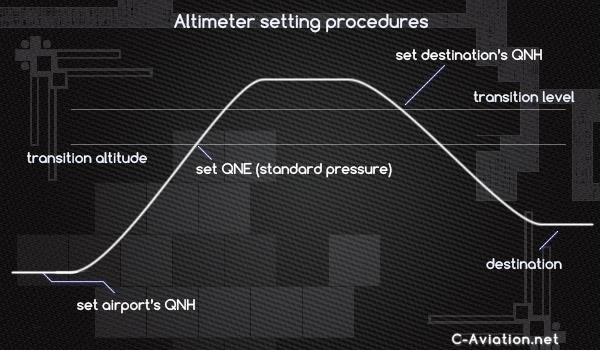 The altitude where you should change altimeter setting from QNH to standard pressure varies. Change QNH to Standard Pressure at transition altitude. When you use Standard pressure you fly at the Flight Level. “Altitude” indicates that you fly using QNH. As you descent – when passing transition level you should switch back to QNH. When two planes fly using QNH their safety depends on them using the same altimeter setting. Otherwise a plane declaring to be at 22000ft could be at the same altitude as another plane who’s pilot was sure he was flying at 21500. Let’s discus an example – a plane flies with altimeter set to 995mb (29.38 in. Hg) at 21500 ft. Another plane with altimeter set to 1013mb (29.92 in Hg) flies at 22000ft. What is the difference in altitude between them? None! They are both flying at the same altitude. That is why above certain altitude (different in each country or region) all planes set their altimeters to standard pressure. From that moment they can compare their altitudes and they do not have to change altimeter setting every time the regional QNH changes. Set your altimeter to local QNH (read QNH in airport’s METAR or use QNH provided by the ATC). At the moment you cross the transition altitude set your altimeter to Standard Pressure – 1013mb / 29.92 in. Hg. At the moment you cross the transition level set your altimeter to local QNH (you can read it at the closest airport’s METAR or the ATC will give it to you). In other words – flight level is the altitude shown when you set standard pressure and it’s given in hundreds of feet (100ft = flight level 001, 1000ft = flight level 010, 10000ft = FL100…). Transition altitude is the same or is located below transition level. The space between the two is called transition layer. Over USA and Canada transition altitude is set at 18.000ft. Transition level is adjusted to QNH. For local QNH higher than 1013,25mb / 29.92 in. Hg. it’s FL180 and for lower QNH it’s FL185. In rare cases of very low QNH, FL190 is used. In Europe transition altitude is based the highest terrain in the area. It can be set country-wide (in Poland it’s 6500ft) or locally (in Italy you need to check TA for each airport). In some countries it is as low as 3000ft (Netherlands). Just like in U.S. and Canada – transition level (TL) is usually adjusted to local QNH. For example in Poland FL80 and FL90 are used (depending on atmospheric pressure). When flying in transition layer you should pay additional attention to other traffic as some planes may use QNH and other – standard pressure. Wrong altimeter setting (especially QNH higher than actual) can lead to CFIT – controlled flight into terrain – as the pilot sees higher altitude on his altimeter. In 1995 Learjet pilot forgot to change standard pressure to QNH on descent to Masset, Canada. He crashed into the sea during night approach. Remember that every milibar of altimeter setting error adds 30 feet of error to altimeter readings. 0,01 in Hg equals 9ft. Altimeter. It's pretty obvious what it shows, but do you know how to set it properly? When to set standard pressure and when to use QNH?